This fashionable and rockin’ clothing review (and giveaway) is brought to you by 10DollarMall.com…. Since I’ve lost weight I’ve been enjoying shopping for a new wardrobe. Of course, if you’re a regular reader of Blog by Donna or you know me personally, you know I’m frugal. I’ll say again, frugal doesn’t necessarily mean cheap… but I do like a bargain. I want quality at a low price. Recently I had the opportunity to do some shopping at 10DollarMall.com. As the name implies, nothing is over $10. Seriously, nothing. I was a little skeptical at first. I mean how can clothing of quality cost only $10, or less? Doesn’t seem possible. 10DollarMall is a deep discount store. You may not find an array of sizes, or many items in stock, so when you do find something you like, you need to order it, because it may be gone the next time you check. I was provided a gift code to 10DollarMall.com to see what I thought of their clothing. It took me a bit, because I wanted to get a variety of items to review. Once I finally made up my mind and placed my order, I received my package in a timely manner. I was excited to see what I’d ordered. This Black Ruffled Dress is the perfect ‘little black dress’. It’s a tank with little ruffles all down the dress. It’s figure flattering. I added a blazer to it, since it was a tad chilly. The “Little Black Dress”. I haven’t bought or worn a “little” black dress in a long time, but since losing weight, I thought I’d take a chance and get one when I saw this cute Black Ruffled Dress at 10DollarMall. This Black and Goldenrod Abstract Maxi Dress is so comfortable and perfect for a night out on the town. I love when comfort and dressed up mingle together like it does in this Black and Goldenrod Abstract Maxi Dress. One of my favorite trends this spring/summer is maxi dresses or skirts. I love the long length. Not only are they comfortable, but figure flattering and look good on every woman. I really like this Black and Goldenrod Abstract Maxi Dress. This sheer blue patterned maxi skirt is comfortable and easy to dress up or down. Speaking of the maxi, I also got this Long Sheer (blue) Skirt. It’s so versatile…. can be dressed up or down. By the way, it is only sheer from the knees down. I’m in ‘skinny’ pants. Sorry, it’s kind of a big deal for me. 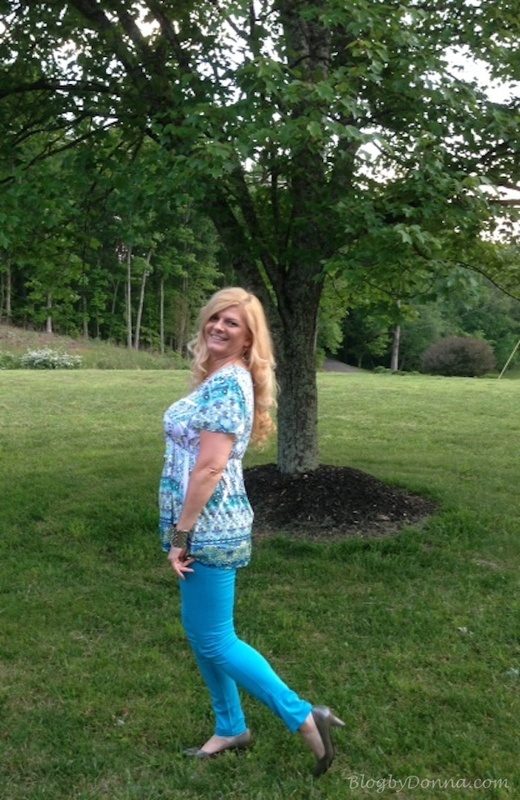 I love these Aqua Thin Skinny Pants from 10DollarMall. Here’s something I thought I’d never say again, much less wear – “skinny” pants. But I am. I got these Aqua Thin Skinny Pants. They are out of my comfort zone, too. No, they are very comfortable, but I normally wouldn’t wear a bold or bright color as far as a pant goes. But this summer I am going out of my “comfort zone”. These pants are so light, perfect for spring and summer. Tangerine 3/4 Sleeve top. It was so windy the day this photo was taken… it was the best shot. My hair was completely covering my face in the other shots. My favorite color is orange. So I couldn’t pass up this Tangerine 3/4 sleeve top. I’ve worn it a couple of times and it has washed well. It’s very comfortable and I can dress it up or down. 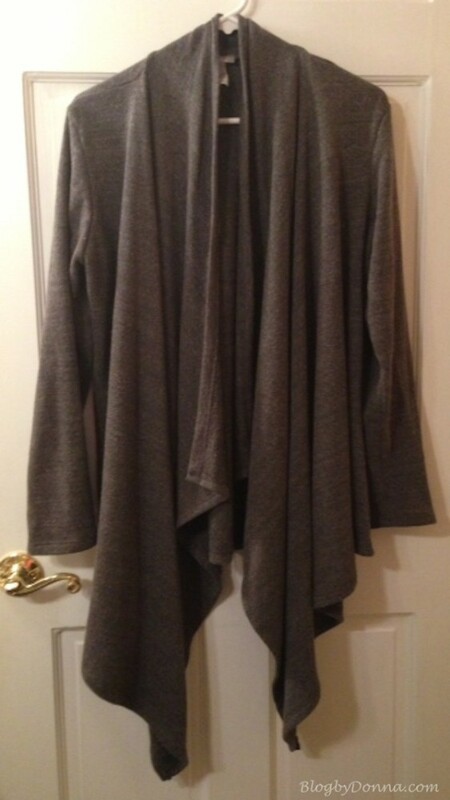 Grey Sweater-Like Cardigan. This cardigan looks so much better on. I love this Grey Sweater-Like Cardigan. It looks much better on than it does on the hanger. I know I’ll get a lot of wear out of it this fall, and on a cool spring or summer night. I also got a Tea Rose Pink Lip Liner with Sharpener. As you can see, I got a lot of items. I tried to get a variety of things to review… and I was/am pleased with all the things I received. They carry jeans, and I’m thinking I may order a couple of pair, soon. I need to check out their boys section, too. A great back-to-school option, especially for those growing kids. They also carry men’s clothing, accessories, shoes, and more. Note: I cannot tell you how difficult it was taking these photos knowing I was posting them on my blog. My mind still hasn’t caught up with the fact that I have lost weight. I don’t feel comfortable in front of the camera. I’m working on it, though. NOW for some really great news! 10DollarMall is going to give a $50 gift card to their store to one of my lucky Blog by Donna readers! Yay! With $50 you can get a lot of things from 10DollarMall.com. Please feel free to complete the entries at your own pace. Remember, you can always come back to enter daily entries. The more entries you submit, the better chances of winning! This giveaway is open to US residents only 18+ older. It ends 6/23rd at 11:59 pm EST. Enter on the Rafflecopter form below. Good luck! Disclaimer: I received a gift card to 10DollarMall.com to facilitate my review. No other compensation was received. All opinions are 100% my own and may differ from yours. WOW – They have alot of nice stuff. I do not need clothes, so I would pick some jewelry. I love the bracelets they have, especially the Gold Beaded Anchor Bracelet. At these prices, I’d be able to get jewelry and an outfit….!! I would love to buy their plus sized tank tops in all of the colors. I’d like to have the Magenta Sheer Blouse. What great prices! I enjoyed checking out all they had to offer at 10dollarmall.com. I like the Dark Grey Hi-Low Top for Women and the Off White Sheer Tunic With Yellow Detail for Women! They have such awesome clothes for great deals! i love this sweater, it’s hard to find ‘lavender’ instead of purple. lots of cute stuff. I can’t believe all the great things you got! I really like the Red Floral Sheer Blouse. I would love to get some dressy jean tops. Like to mix and match my outfits. I’d love to buy their purses and sunglasses. All of mine have been terribly worn out and since summer is coming up, I’m looking out to go on the road with my kids! I absolutely love all of these items and since I’ve recently lost quite a few lbs I definitely need to buy new clothes and this is a great place to start. You and TDM are so generous for having this offer! Wow! Also, you look fantastic in all of your items. I really enjoy your blog and am thankful to be able to enter for a chance at winning $50 toward new clothes!! Good Luck everyone! I’d get the Black And White Blouse With Cut-Out Shoulders. Thanks. I’d like to buy the Orange Fresh Summer Top. So pretty! I’d like to buy the Green Multi-Color Floral Tunic. I see somany things I like! I would definately buy the black and Pink Floral Chiffon Button down sleeveless blouse for $9.99. Thanks for the giveaway!